For a couple of years our geese have roamed around the house and garden, mostly because we didn't have a separate fenced area. Although we loved wandering among the geese and they did a brilliant job of keeping the grass down they also ate just about everything else. The final straw came when my budding bulbs began disappearing. Did you know geese are excellent at excavating bulbs? The batam (cross) chickens had been locked into the lower half of the chook run and chook house as they were unbelievably efficient at ploughing my garden beds. We had divided the chook run to accomodate our first batch of goslings just in case the male geese became aggressive toward them. For a while our poultry yard was overcrowed and this resulted in the fence and new goose yard listed as top priority. With the geese in their new enclosure we cut a 'door' into the top half of the chook run from the chook house yard and closed the door that led to the lower half. After clearing the various pieces of junk that served as sun shelters and nesting boxes from the lower yard we dug the amazingly rich, fertile soil over, created a few areas for planting, added some compost and planted seeds. While turning over the soil we discovered an old reed pond we'd installed in the early days of the chook yard that was designed to take the water from the duck bath. It was full of sand - a perfect medium for growing carrots. 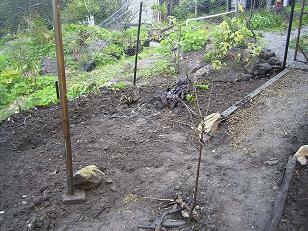 I edged that area with an old sleeper and planted a row of mixed lettuce seeds. An old gnarled section of gum tree stump was placed to retain soil for our silverbeet bed. Under a small tree (we can't remember what it is) we've transplanted some old strawberries. They won't bear fantastically but will give us about a punnet a day and that will do. Beside that I've sprinkled some broccoli seeds. 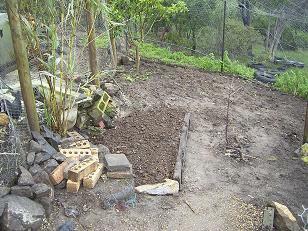 Robin cleaned the chook house and we buried the manured sawdust in a shallow trench along the edge of the yard. It will sit there and compost ready for the sweet corn I'm planning on planting towards the end of spring. All I need to do is work out where to grow the tomatoes, plant some delicious herbs and companion plants and our spring/summer vegie garden will be complete. And best of all, the chooks, geese and ducks can't get at it! 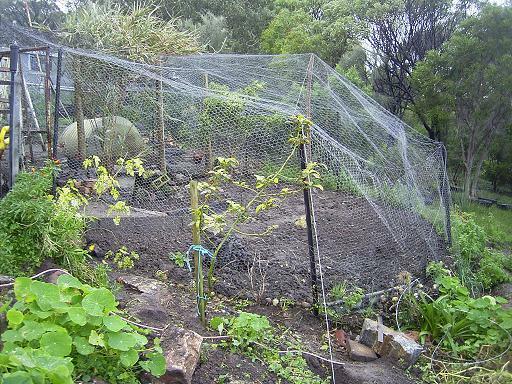 With the fox proof wire netting overhead the almond tree (pictured in the centre) wil be safe from marauding corellas, galahs and rosellas. Magpies won't be able to push their beaks into the soil and pull up the seedlings as they appear either. 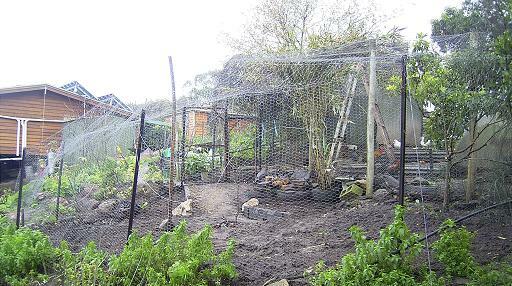 Come next autumn we'll let the poutry occupy the space again and plough the soil, clean up the weeds, eat the surplus vegies and manure our vegie garden for the next growing season.